Roughly 17.5 percent of the freshman class have been notified with fifth week flags that they are either failing or are in danger of failing a class. 176 freshmen received fifth-week flags in at least one of their classes. This percentage is consistent with last year’s 18.3 percent. The seven-year average for fall semester flags is 19 percent, said Julie B. Norman, senior associate dean for Academic Resources and Programming. Freshman are supposed to be notified by their instructors in the fifth or sixth week of classes if they are performing poorly. Once a flag is issued, the student’s advisor and Norman are both notified. Final statistics on the number of flags were not available until this week, eight weeks into the academic term, because Norman’s office was waiting on one core freshman class to report its flags. Norman would not say which class caused the delay. Flags are generally evenly divided among freshmen classes, but this year saw a rise in the number of flags in Classical Mechanics (8.01), Norman said. However, actual freshman performance in the course is on par with, if not better than, that of previous years, said Dr. Peter Dourmashkin, an 8.01 instructor and the head of Course Material Development for 8.01 TEAL (Technology-Enhanced Active Learning). A slightly difficult first exam and minor changes to the grading system may have contributed to the increase in the number of flags, he said. But it is difficult to predict who will be failing “in the fifth week, after only one exam. 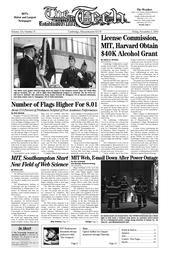 Most freshmen are still getting acclimated to the MIT course load,” Dourmashkin said. Indeed, fifth week flags are designed to be an “early warning system,” Norman said. Upon receiving a flag, students are encouraged to pursue tutoring, attend lectures, and go to office hours. The good news is that a high number of freshmen who receive fifth week flags go on to pass the class. Last year, 70 percent of those who received fifth week flags eventually passed the course, she said.